This is a sponsored post in collaboration with El Mejor Nido by Nestlé. The recipe, pictures and opinions are 100% my own! It’s amazing how fast this year is moving! I can’t believe Easter is only a few days away. Every celebration in my family revolves around lots of great food and delicious drinks. 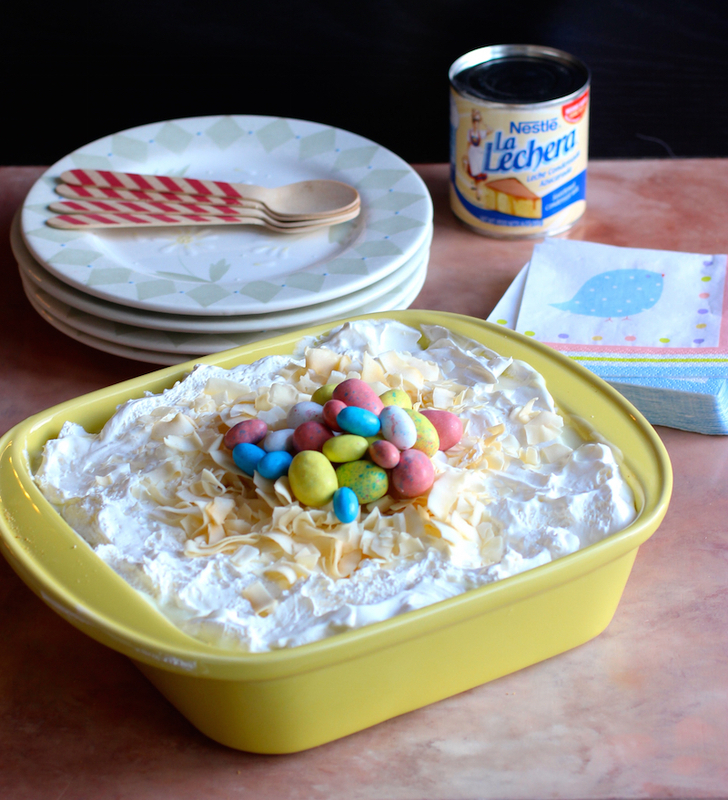 So when I was invited to participate in a campaign with El Mejor Nido, I found the perfect excuse to make an easy and simple recipe, yet very special, Crackers and Sweet Condensed Milk Dessert. Sounds delicious, doesn’t it? This is one of the desserts I miss most from my childhood, and not just for the taste. I would often have Crackers and Sweet Condensed Milk Dessert while at my grandmother’s house, which we would prepare together and I loved cooking with Mamita! Those times spent cooking together made for some wonderful memories. I am always delighted when testing the layers of crackers blended into a delicious, creamy filling of sweet condensed milk with a delicate vanilla flavor and a coconut frosting. As an adult I occasionally let my culinary nostalgia create different versions of this easy-to-make dessert from my childhood. 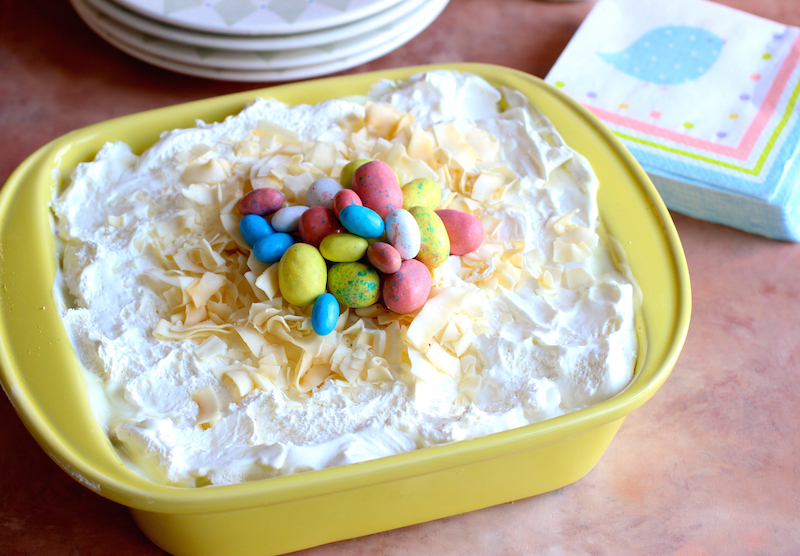 This time I thought it would be a good idea to decorate the frosting with grated coconut and chocolate eggs to celebrate Easter. This is ideal for any party or while having a cup of tea with friends. You can leave it in the fridge for up to three days, as long as you keep it well covered. All you have to do is decorate it last minute and serve. I invite you to visit ElMejorNido.com to find more recipes and information about the products. Connect with them through Facebook and Twitter. Tell us what you would like to make in the comment section below, using Nestle Sweet Condensed Milk and have a chance to win a gift card worth fifty dollars (US $ 50.00). This giveaway is open to US residents age 18 or older. Winners will be selected via random draw and will be notified by e-mail. Giveaway ends April 8, 2015. Good luck! 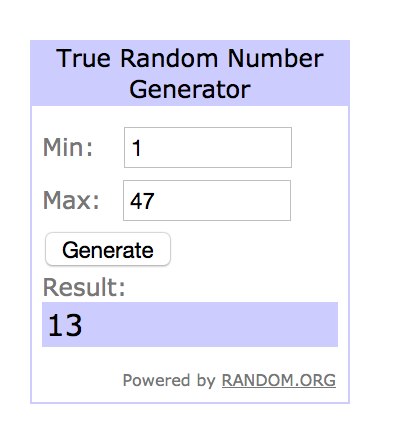 The winner is Cristina comment #13. Congratulations! To prepare the filling, boil over medium heat the condensed milk, vanilla extract, reserving 3 tablespoons of evaporated milk to dissolve the cornstarch. In another bowl dissolve the cornstarch in the three tablespoons of evaporated milk and then add it to the boiling mixture. Stir constantly to mix well. About 10 minutes. Remove from the heat, quickly add the cream and stir again. 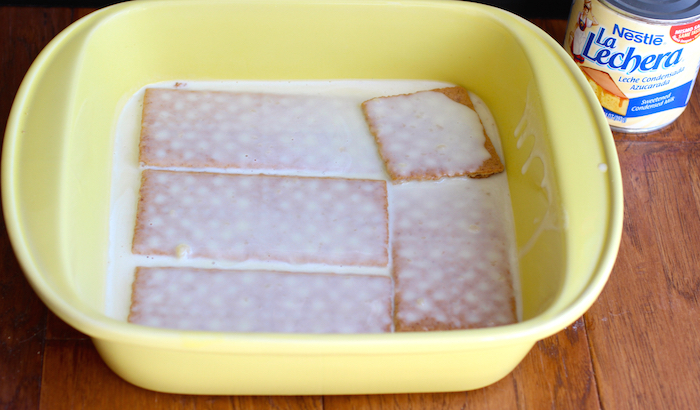 In an 8 x 8 inches ovenproof pan put a layer of crackers and a layer of cream alternately. Repeat the process ending with a layer of cream. Refrigerate for 5 hours or until desired consistency. 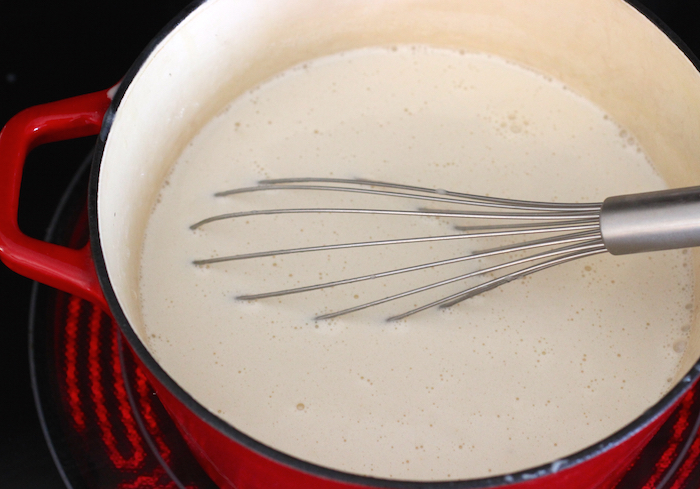 Whisk the coconut cream on medium speed for about 4 minutes, or until the cream forms soft peaks. Add the sugar and beat until incorporated.Spread on top of the dessert and garnish with grated coconut and chocolate eggs. In my family we always make Arroz con Leche with Nestle Sweet Condensed Milk. 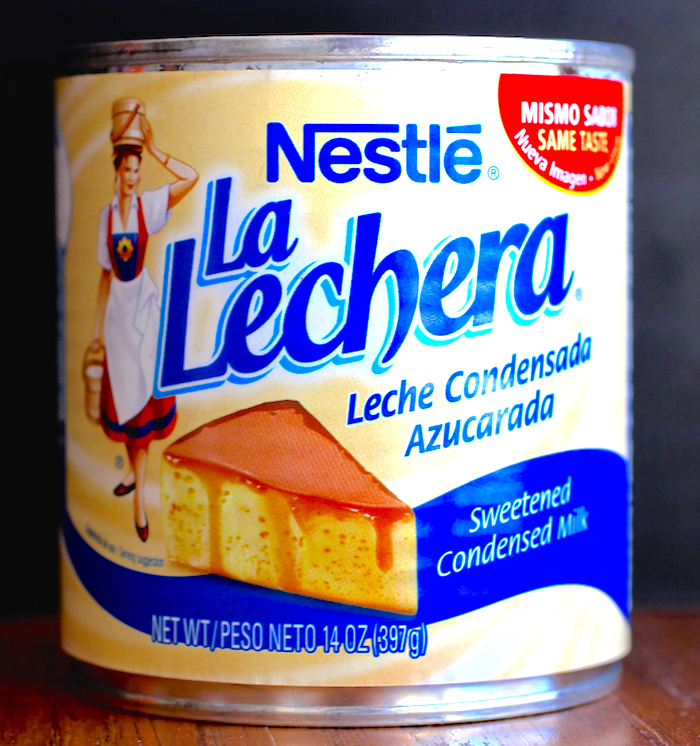 I’m going to make your Tres Leches de Café using Nestle Sweet Condensed Milk. I’ve made your Chocolate Tres Leches cake before and it was divine. As a coffee lover, I can only imagine de café will be even better! Easter a few days away? I am typing this (it is Good Friday) and the band accompanying El Señor to his meeting with La Virgen is playing outside the Parish Church as the paso passes up the main street. I have lots of crackers that need to be used up soon. This recipes comes just in time. Thanks for sharing, Erica. This recipe was handed down from my grandma Meta. It was that special treat we always looked forward to and could never get enough of. Enjoy. Preheat oven to 325. Grease an 8×8, 9×9, or 9×13 pan. Any size will do remembering the smaller the pan the longer it will need to bake. In a large bowl, combine crumbs and chocolate morsels until incorporated. One at a time, open a can of condensed milk and pour into bowl with crumbs-chocolate combination, being careful to scrape inside and lid of can with rubber spatula for every last drop. 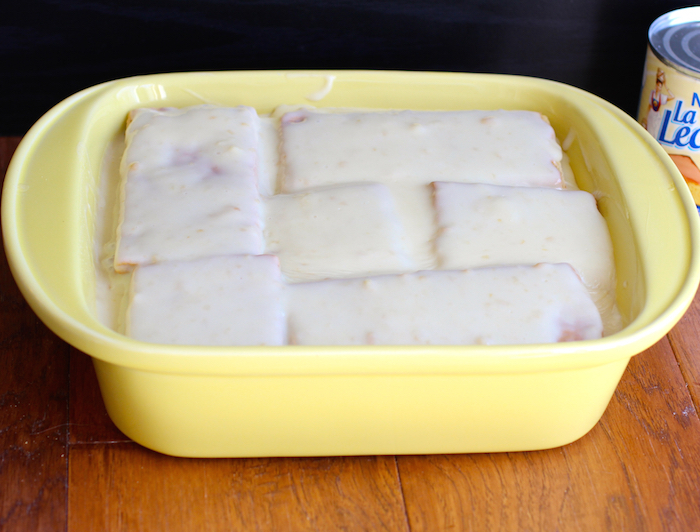 Fold in condensed milk partially to get things started. It will become clear why, as the mixture gets sticky and thick rather quickly. Repeat process with second can. Stir until well incorporated and no dry crumbs can be seen. Pour into greased baking pan. Smooth with rubber spatula to level and fill corners. Bake for 25-35 minutes or until a toothpick comes out almost clean. Let cool in pan for 10-15 minutes on a wire rack to set, pan should still be warm. Cut into portions. Remove with metal or wood spatula. Enjoy. I would love to use this for some key lime pie! My husband is Colombian and loves condensed milk in everything! My favorite recipe I have learned from his family is a fruit salad with condensed milk, marshmallows, and shredded coconut and whipped cream. So delicious! I’d like to make some flan. I use sweet condensed milk in my iced coffee drinks. I would love to make blended iced coffee from a recipe I found on Erica’s site using condensed milk! Cherry Fluff – Cherry pie filling, sweetened condensed milk, whipped cream, pineapple, mandarin oranges, coconut and marshmallows. 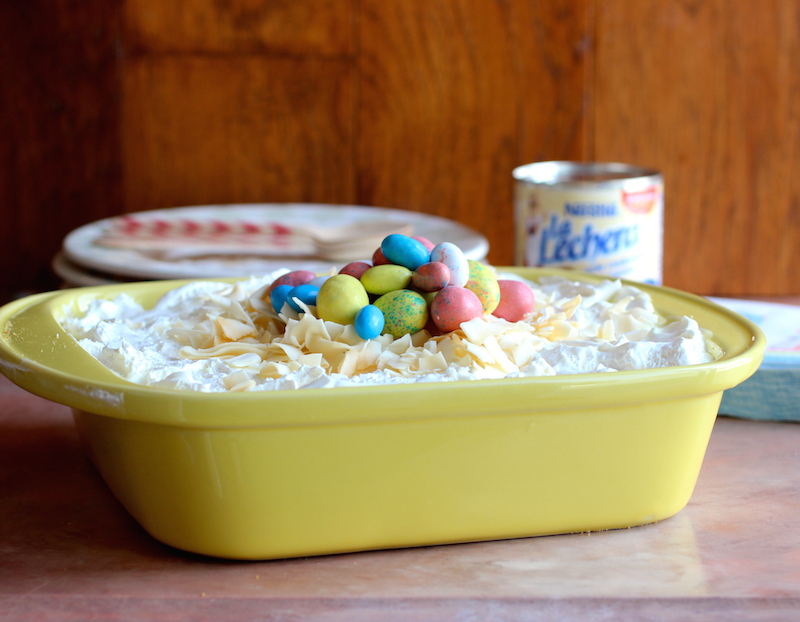 It’s an Easter favorite. 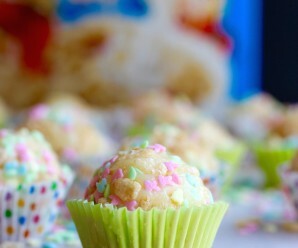 This recipe looks wonderful and easy! I was going to say Tres Leches cake but then I read a comment about chocolate tres leches and a coffee flavor as well !?!?!? Now those are two cakes worth trying! Drool! 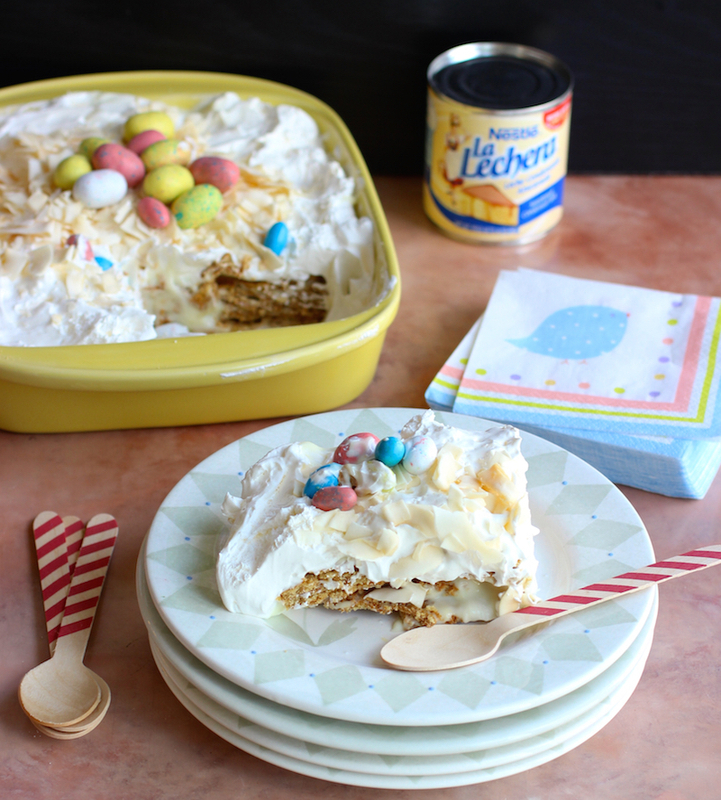 I’ve been wanting to make my very own Tres Leches de Café cake and your version looks delicious! That’s what I would make, definitely! 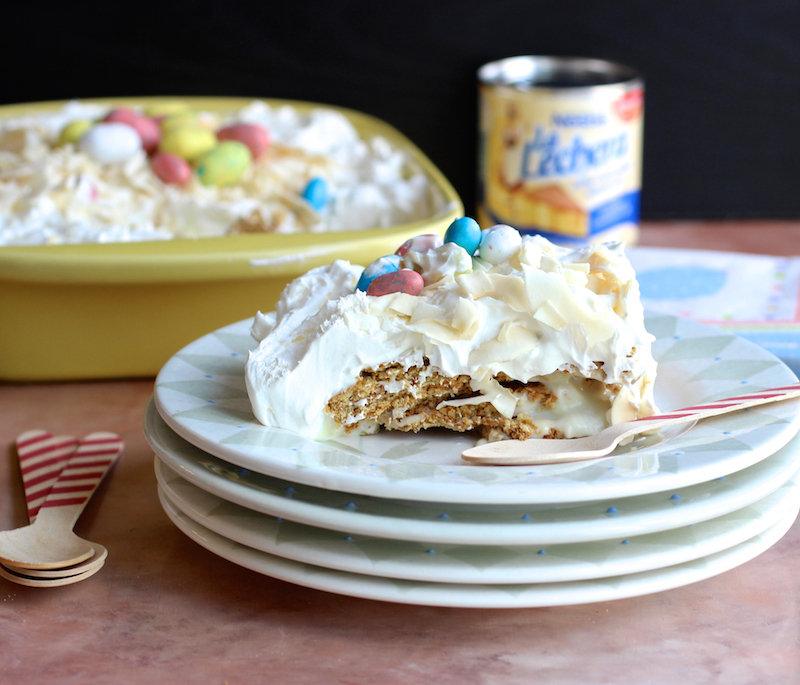 I’ll like to make Carrot Cake with Coconut and Dulce de Leche for Easter. My niece just adopted 2 kids from Colombia and I’d love to make something for them that reminds them of their home country. Your Tres Leches with Coffee recipe sounds great. I’d love to try this! I also use condensed milk in my banana pudding recipe. It’s heavenly. Thanks, for the recipe sounds delicious and can’t wait to try it! 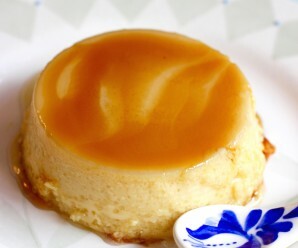 I love making flan using Nestle Sweet Condensed Milk. 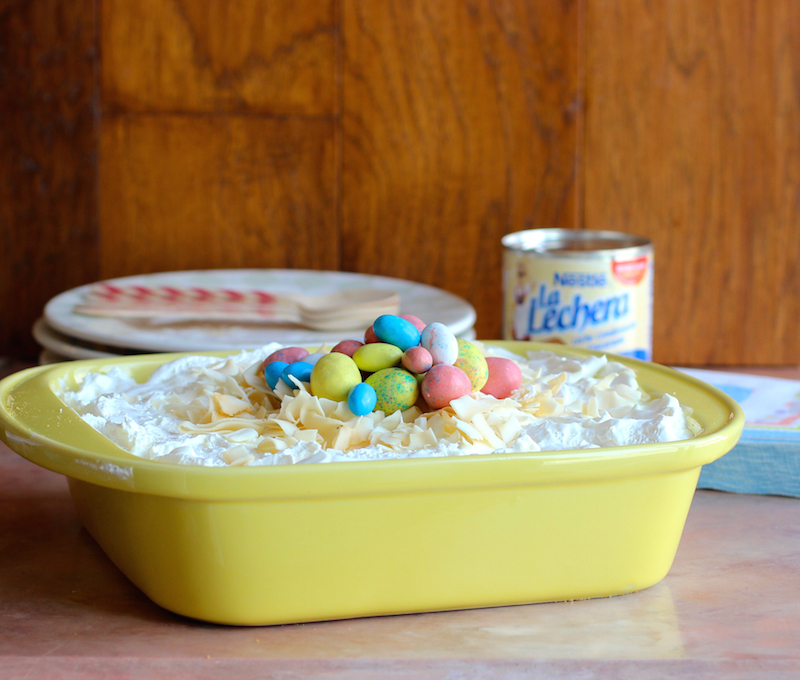 I would like to make Tres Leches cake. I love pumpkin so , I would make pumkin pie flan. I would like to make Crema de Fruta with Nestle condensed milk. I would make my moms fudge recipe. She always used Nestle chocolate chips and condensed milk. I also want to try the oatmeal scotchie recipe from the Nestle site. Im a big butterscotch fan. sweetened condensed milk makes an awesome key lime pie, but this dessert you’ve made appeals to me even more than that! Hi! I love a good Tres Leches cake. 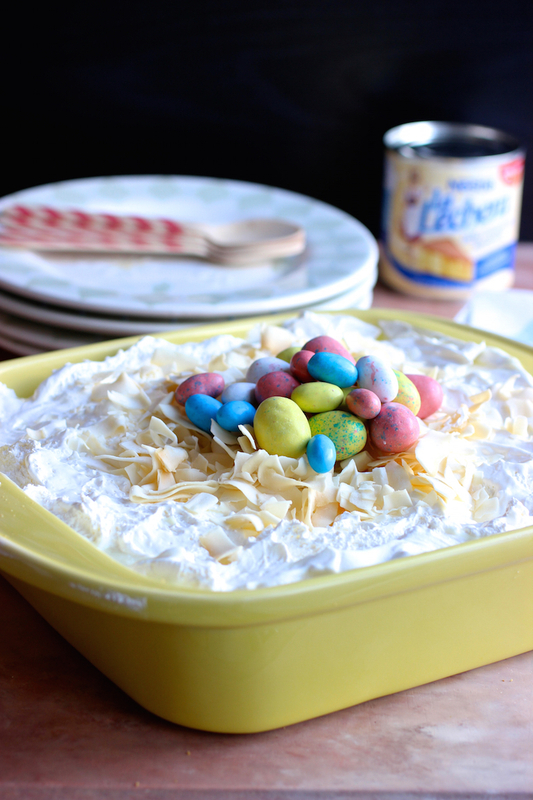 I’d like to try your recipe for Coconut Tres Leches using Nestle Sweetened Condensed Milk. Thanks for all the awesome recipes! 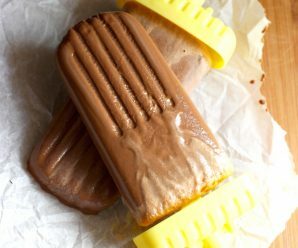 Uso la leche condensada para hacer salsa de chocolate y la leche condensada y queda deliciosa para mojar bizcochos es una delicia. I would make stuffed croissants! I would most definitely try this recipe, it looks so easy and I bet it’s delicious. Next, I’d try your Coconut Tres Leches. Yummm! I have family over this weekend, celebrating the Orthodox Easter, I now know what I’m making for desert! 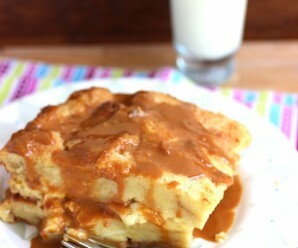 I would make a Chocoflan with Nestle Sweet Condensed Milk, it’s delicious! I would love to make a cherry cheesecake with the condensed milk. 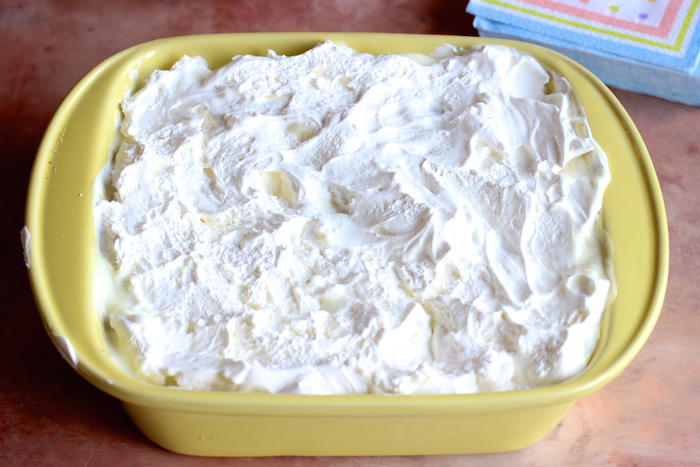 Oh I would love to make Banana pudding Dessert! You layer Vanilla wafters, bananas, and sweetened condensed milk mixed with pudding! Oh it is so good! I would use Nestle Sweet Condensed Milk to make carrot cake. I would use it to make Magic Cookie Bars. It’s melted butter, graham cracker crumbs, sweetened condensed milk, coconut, chocolate chips and pecan pieces! So good! I’d love to make some delicious banana pudding with it. Dulce de Leche ice cream! Yum! I would use it to make a cake!